Gordon Hall, The Number of Inches Between Them, 2018. Performance view. Gordon Hall. Photo: Cassandra Rodriguez. 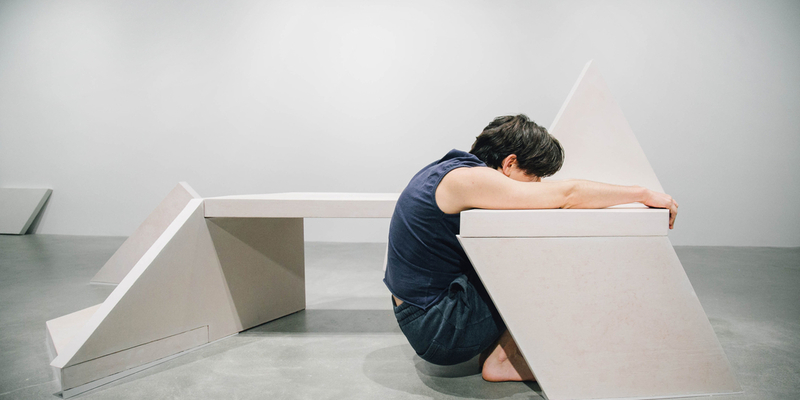 Gordon Hall’s The Number of Inches Between Them, 2018, replicates a found sculptural bench and serves as a platform for choreography. It is on view at the MIT List Visual Arts Center in Cambridge, Massachusetts, through May 20, 2018. Below, Hall addresses their integrative approach to object making and performance. THE SHOW AT THE LIST CENTER, which includes sculptures, a letter, and a performance, is quiet and slow. I think of it both as a space of grief and a space to grieve. The performance features four people in their seventies and eighties, who sit on and use a concrete bench in a variety of ways. While I was developing this project, Congress was attempting to repeal the Affordable Care Act. I kept hearing politicians say, “If you get sick, you’ll need health insurance.” This word if really hung in my ears, if and not when, as if illness and disability were exceptions and not facts of all lives—a fantasy of eternal able-bodiedness and autonomy. I was already asking myself questions about what kinds of responsibilities we have to each other, physically, symbolically, and societally, in terms of supporting each other. The intimacy I established with Dennis’s bench became a way of reflecting on support while physically making an object of support. I remade the bench twice, assembling one of them like the original and leaving the other in its component concrete parts leaning around the gallery’s walls, a body taken apart and put together. Alongside my elder performers, I also perform with the bench, draping my body over it in a memorized and repeated series of poses. All of it is orchestrated to slow down our attention spans. I’ve always been committed to that. Especially this past year, a deep perceptual fatigue and an inability to process what is happening have made me more committed to making work that does not mimic that kind of pacing or attention economy. I don’t want to bore people, but I am interested in pushing viewers right up to the edge of boredom to see what is possible when there are just a few elements and the piece is moving along slowly. I ask my audience to do some work in order to have a meaningful experience—this work isn’t intended to entertain. In Brothers and Sisters, a recent performance at The Renaissance Society, I performed a repeated phrase of movements with slight variations, moving among and interacting with a group of my sculptures that were arranged around the gallery space to create a path for my movements. Each phrase originated in one of the sculptures, and then I strung them together into a sort of body-sentence, writing with objects and movements. I am curious about what it means to be watched by others, to present my non-traditional body to the gaze of strangers. I have thought about this in a few ways, including in terms of what I have called “reparative objectification” in “Party Friends,” an essay that I wrote about the years I spent partying in Chicago and the life and death of the artist Mark Aguhar. There is also an erotics in the way that I (and the viewer, I hope) relate to the objects—a bodily relationship that aims to produce intimate, hard-to-recognize body feelings. I came to sculpture through being a dancer, and so I make the objects with my body and then figure out what to do with them using my own and other people’s bodies. I have a lot of faith in our ability to change the way we understand what we are looking at and feeling. With this project in particular, the rather futile act of recuperating just one largely unremembered life by getting to know this artwork and piece of furniture feels important. The scale of the loss is so great that it’s more of a gesture toward attempting to enter that loss somewhere, with someone—and to do this by getting close to an object, understanding its design and developing a relationship with it and with the past as a result. I make sculptures that are meant for actual or imagined movement with bodies. The space between, where the furniture meets your body, that little gap that closes when you sit down or touch something—that’s what I get excited about. With this object, I didn’t go out searching for a bench. It’s like having a crush on someone or the way you can imagine exactly what the body of someone you’ve slept with feels like even when they’re not there.